Hi guys, it’s been a while! If you don’t count those two solitary posts from August and September, you could say that I haven’t blogged in, like, 6 months?! Now that I’ve promised to reactive the blog I’ve abandoned for months, I have to keep it going! I’ve been thinking a lot about what direction I should take my blog. I was ready to give up, throw in the towel. But when I thought about it long and hard, I realized I really like having my own place to share all the cool places, cute cafes, interesting facts and even just my daily boring life sometimes. At the moment I’m rather busy not only with the daily grind, but also things like job-hunting and studying for the next JLPT, so I won’t be able to post that often — I promise to keep updating at a somewhat steady pace though. I also realized that I didn’t give you much opportunity to read about my experiences or personal views on different topics. In fact I was rather vanilla when it came to choosing topics to write about. I didn’t want to touch controversial topics before, but now I think ‘Actually, WHY NOT?’ So yeah, anyway, feel free to ask me questions about me and my life in Japan, if there’s anything you ever wondered about or there was no one yet to answer your question. I’ll try to include more advice and recommendations as I get asked about various things quite frequently. Hopefully you’ll like this makeover. I won’t be posting my OOTDs anymore as Instagram seems to work better for these type of photos (I will sell some of my stuff though, check out my Depop account!). I decided to keep my monthly digest posts, as they probably give a good insight into what the daily life of someone who decided to live their life in Japan looks like, although it might not be as exciting or crazy as most people imagine. The last few months were like a crazy roller coaster though, with an insane amount of ups and downs. Let me fill you in on what has happened and what is going on. … and even became a Hina Doll for a day. Like I said, it started off pretty well. I should have known that just when everything seems fine, you should expect life will kick you in the teeth, and most likely will do it with twice the power you could ever expect. Having said that, the end of September was absolutely horrible. Whatever happened, and some rather heavy stuff did, it was the main reason I stopped blogging for a while. I will not go into needless details here as it’s all far away and there’s no real point in digging it up now. If you follow my social media and have any sort of deducting skills, you probably figured it out anyway. At that time I just needed some time off. I went back to instagramming fairly quick, but mainly because it’s fast and easy— and taking pics around Tokyo was one of the things that made (and still makes) me happy. I was still in some kind of an online hiatus for the bigger part of October and didn’t go out that much hence the lack of pics. I did go out to eat sometimes and discovered that Taco Bell is the feast of gods and chestnut ice cream isn’t edible at all. Really, listen to my advice on this one and don’t ever buy chestnut ice cream. I’m lucky to have amazing friends who don’t mind dressing up in silly costumes and taking purikura pics with me, despite the fact that we’re both closer to 30, rather than 20 years old. While we’re on that topic, I thought it would be interesting to introduce my best friend Ayaka and tell you about her in more detail, so a special blog post might happen someday soon. On the last day of October I spent a lovely day in Kichijoji, wandering around Inokashira Park and hunting for cute cafes. If you haven’t been there, plan a trip to Kichijoji for your next day off because the area is top notch! For quite a while I felt strong aversion to all things Korean and was kinda worried that the September stuff would irreparably ruin BIGBANG for me, but worry not, it didn’t. The boys gave their best again and this time I was lucky enough to have gotten tickets for two days! I went to one of the concerts with my friend Sharla and here you can see her video of us preparing for the concert and here’s the one taken on the concert day! And actually, ever since the concert, things started to get better and better. 6th of December. I had the JLPT test in the morning and as I studied for it for a few weeks, I didn’t worry about it too much (← OK, that’s a total lie, I was freaking out). My JLPT took place in Ichikawa in Chiba Prefecture and from there I had to somehow transport myself to Yokohama, 2 hours away by train. Needless to say I was absolutely exhausted by the time I got to the next venue but it was all worth it. I got to attend a very special event and see things not many people have a chance to see with their own eyes. There will be a whole post dedicated to it, so I won’t go into much detail now. I’ll just give you a quick sneak peek. On the 31st I did what most people in Japan do. I ate toshikoshi soba, went to a shrine and wrote down my wishes for the New Year on a prayer plaque. I went to the majestic Yasukuni Shrine and drank amazake… Then I had to kill time for nearly 3 hours in a manga cafe watching TV, but that’s a story for another time. Several minutes before midnight I stood in front of Tokyo Tower and was virtually floating along in the wild crowd. I guess the only reason I didn’t get trampled by the excitedly celebrating crowd was that there was someone in that crowd who held my hand. 3 years ago I arrived in Japan. I like to think that everything happens for a reason and particular events in life lead me to the place I am right now. Coming to Japan was definitely a new beginning. I got a job, I met amazing people, I became completely independent. I started my adult life right here in Japan, 9000 kilometers away from home. After 3 years, I feel a lot of routine in my life. Work, home, PC, sleep, work, home, PC, sleep. That initial enthusiasm and interest in everything around me has gradually disappeared. I got used to being here, I know all the things you won’t read about in guidebooks with pretty pictures. Sometimes I miss that feeling of bliss when I opened my eyes in the morning and thought “Wow, I’m in Japan, this is amazing”. I’ve been a bit grumpy lately, for a bunch of reasons it was hard for me to find much positiveness in the daily grind. I needed to see the good things again, so I sat down and wrote down all the things I like about Japan and how it changed me and my life. Downtown Tokyo is exactly how you imagine it — full of neon lights, skyscrapers, busy people who never let go of their phones. But once you realize that you’ve been to all the touristy places, you start exploring. You can wander around Tokyo for hours, days, months and I am absolutely sure you will find new things every few steps. Hidden cafes with clientele with an average age of over 70, unique street art splattered all around, lovely tiny stray cats, little shops with handmade or vintage items that can’t sadly compete with the monolithic vast department stores and gradually disappear. Don’t think too much about the weird Japan you know from TV or newspapers. Forget the supposed forehead bagel ‘trend’ (the biggest nonsense I’ve seen in my life I swear), forget otaku and idol culture, underwear vending machines (they probably exist in some deep dirty underground, but trust me — regular people don’t think it’s okay) don’t think too much about Harajuku fashion — that’s all part of Japan I suppose , but it is not how Japan really is. People queue and rarely cut in lines, no one’s business is more or less important than others’. There are instructions, notifications, warnings and signs everywhere. Though sometimes you might feel it’s really patronizing, you will always know what to do, how to use things, how to get somewhere — because it is all written and explained somewhere for your convenience. For that reason I think I am more gullible and take things for granted. In the UK I took some yen to the city center in order to exchange it to pounds. I found a legit looking currency exchange point, handed money to a good-looking cashier, got my money, counted it and was a bit surprised I received much less than I expected. But I thought I must have made a mistake calculating. It just didn’t cross my mind to ask about anything. When I went back home I checked the receipt I got and that’s when I saw I was charged a 10% service fee. There was no information on the counter. There would be a notice on the counter and the cashier would *probably* inform me about it — if it was Japan. I still can’t stop myself from cringing whenever I open a bag of snacks and I find that each little piece is packed in a separate paper creating mountains of trash. However! I can’t imagine throwing trash on the street or leaving it on the train, now I can carry it in my bag all day if I need to do that. If I had a dog, I would clean after it thoroughly. I sort garbage: burnables, non-burnables, plastics, cans, glass, household items, batteries… I can’t say I don’t make sorting mistakes anymore, but I do my best. As you may know a few weeks ago I visited my family and friends in the UK and Poland, and let me just say that clean Japanese streets never looked better than the moment I saw them again after 2 weeks of being away. Despite all the bureaucracy that will make you cry at some point, life in Japan is very comfortable. Restaurants, convenience stores, karaoke booths, video rental stores open 24 hours. Vending machines (with drinks, alcohol, cigarettes, sometimes even canned soup) every 50 steps. Buses and trains, which are rarely late (but it DOES happen, usually because of bad weather conditions or sad ‘human accidents’) and most commutes are super fast. 6. Most of the time it’s actually very quiet here! Talking on the phone on any public means of transportation is forbidden and basically people follow along with that. Surprisingly enough, if you’re not on one of the main streets, sometimes you might even forget you’re in Tokyo. Apart from summer festivals, shopping stores during sales where shopping assistants shout so loud you start wondering how is it humanly possible to produce those decibels and maybe izakaya drinking spots, where groups of young professionals or salarymen forget they should keep it down after a few pints of liquid courage… Apart from all that, it’s actually REALLY quiet. Drivers don’t honk and I even have a feeling I don’t hear ambulance or fire trucks sirens that often either! I don’t worry about being mugged on the street, I rather worry about being ran into by cyclists, who think all of the pavement is completely their territory. Sometimes I read comments under articles like this one about a girl getting stabbed in the back on the street at about 11PM. I remember one of the comments said “What was a 17-year old girl doing at this time of night alone on the street?” and that’s when I knew that person has never been to Japan and has no idea about this country whatsoever. Everyday I see high school or even junior high school students going back home at 10-11PM… or even later. Walking slowly with their eyes glued to their smartphones, exhausted after cram school, club activities, piano lessons, secret dates maybe… I finish work at 10PM and go back home around 11PM much more often than I care to admit. Except a few rare nanpa pick-up attempts, no one has ever bothered me on my way back home and trust me, I have a bit of walking to do to get there. Unfortunately I can’t also say that absolutely nothing weird has ever happened on the streets of Tokyo (or should I say trains *cough*), but there’s enough crazy people anywhere in this world and it’s a whole other story anyway. It is a good point for me, but I will understand if you think otherwise: interactions between people are kept to a minimum in this country. There are single seats in every restaurant, sometimes you don’t even have to talk to the staff member to order — you just buy a food ticket from a machine and hand it in. People won’t talk to you on the train or the plane and cashiers won’t try to be all too friendly as in “Oh, I like your flesh tunnels, how big are they? You know I have a friend, who has flesh tunnels too and a few tattoos as well…” as often happened in the UK. I’m not saying it is bad — though personally, I never know how to respond to such banter. I get all awkward and say stuff like “Oh I see, ha, that’s nice hehe..he”. Well, they might make some comments about you being a foreigner, but most of the time they’ll lack the courage to do so. It’s rare for people to start conversations here and because I am not a person who enjoys a casual chat with a stranger in the park, I appreciate that most of the time the Japanese mind their own business. 9. All the cute stuff! Everyone knows that Japan has all kinds of cool stuff going on. Interesting gadgets, cute accessories, cutting edge toilets, silly useless stuff you don’t need, but want to have. Cute characters, themed cafes, lots of merchandise for manga and anime characters as well as adorable Sanrio creations. My most ridiculous purchase up to date has to be a futon for my phone. Have I used it? Nope, but I took a fun photo of it. …which literally means “a member of society”. In this homogeneous country everyone has their role to fulfill and playing by the rules is really important. Avoiding conflicts, confrontations, hiding what one really thinks — I honestly think this is why Japan is seen as such peaceful country. I came to understand how to be a part of it, or at least how to try to be a part of it. I’m more of a listener than a speaker. It might be because of my job, where what I basically do is listen to what others tell me about their life, job, hobbies etc and I always react appropriately. I am more careful about making bold statements and expressing personal opinions. I won’t talk about controversial topics unless asked. Is it good? I don’t know, but I know it saves you trouble in cases when your conversation partner has completely opposite views on politics, society etc. Japan teaches you how to co-exist peacefully with all kinds of people. Most of you, my readers, will know that I have studied something connected to Asia. And if you’ve been with me at least since → this post ←, you will know it was Far East Studies and Asia Pacific Studies. But what happened before I got the chance to study what I was really interested in? Unfortunately we usually have no choice but to go through High School, and although I rarely mention it, I guess I’ll make an exception today. As a Junior High school student I liked writing stuff and thought I was good at it, so when I had to choose a High School, I was sure I wanted to go to one that had a class with an extended curriculum in Polish, English and History — a so-called “journalism class”. I won’t lie and say it helped me develop my writing skills — In some way I could say it kinda almost killed them at some point (as well as my passion for History), but now my skills and passion are back, so it’s all good. Where is this all going? There were 35 of us if I remember correctly. And if I’m not mistaken, only one person has actually pursued a journalism career. A few months ago she contacted me, asking for an interview for a local magazine she works at. And I said yes. It’s nothing big, but hey, Rome wasn’t built in a day, right?! In Stasia’s case, it was neither anime nor manga that sparked her interest in Japan — it was music. (In case you ever wondered, the very first music video from Japan I saw was MUCC – Saishuu Ressha) It all started with music, so different from all that was popular at that time. 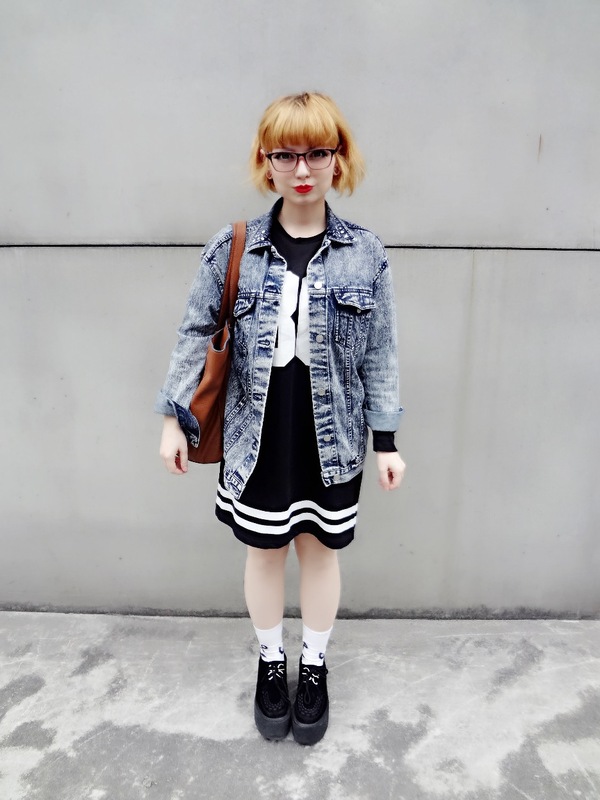 A unique stage look, colourful image — all that made me interested in Japanese street fashion and subcultures. An interest soon became a hobby, and a bit later something I wanted to pursue as a career. — she says. Going to Japan was a dream that she never gave up on. Polish citizens are required to get a Japanese visa in order to live there. To obtain it, they have 3 choices: to marry a Japanese citizen, to sign up for a pricey language course or to find a job. Stasia knew that the last option was the only one she had. She decided to get work experience in companies connected to Japan. In London, she worked for a Japanese catering company serving passengers of Japanese airlines. In the evenings, she worked as a waitress at a sushi bar and her coworkers helped her practice the language. Also in London she had her first interview with the company that later hired her in Tokyo. She got the job and she could replace her tourist visa with a special visa for language teachers (Specialist in Humanities & International Services). For over two years she’s been working at the same school — she teaches both, daily conversation and business English. Among her clients you’ll find university students, housewives, elderly people, businessmen as well as kids, who show their gratitude by giving her colourful letters with cute drawings. In July 2012 she moved to Japan. At the very beginning I lived in a guesthouse, in an area considered rather boring, but I still feel nostalgia for it. Tokyo divides into two parts: Yamanote — tall buildings, clubs, high brands and neon lights, and Shitamachi — which is not as fashionable, and there’s lots of stray cats and senior citizens. I lived in different guesthouses in different parts of Shitamachi for about a year. That might be a good solution for foreigners, as moving in is fast, the fees are fixed and basically it is possible to communicate in English (which is NOT common in Japan), BUT it is not something I recommend for the long run — she says and adds that none of her rooms were bigger than 7 square meters. BONUS! Here you can see all my rooms. Don’t trust the photos, they take them with a special lens that make the rooms look spacious. After a year she managed to rent her own apartment with a small kitchen and a bathroom. For her it was “something”, but for her Polish friends it was just a tiny room. (Okay, here I want to mention that as for Japanese standards my apartment is definitely not tiny as I have two rooms for myself, I really need to write a blog post about it…) She admits that it didn’t take that much time to get accustomed to living in a big city like Tokyo; she already knew so much about the country, its culture and Japanese peoples’ lifestyle. But it was not always perfect. — Japan is a country with an unimaginable level of bureaucracy. One needs to make lots of phone calls, visit several offices and gather a pile of documents just to get one thing done. When my Japanese was still not good enough to deal with all that, I needed to ask my friends to help me. Getting used to the working style of Japanese people wasn’t that easy either. — she mentions as she speaks about difficulties she experienced at the beginning. Now, she has no trouble communicating in Japanese. (Well, yes and no. I can have a normal conversation, make phone calls, deal with banks etc. but discussing more complicated stuff like politics is still kinda hard). She respects Japanese for being well-organized. — Everything is in a perfect order, everybody waits patiently in line for their turn. Laws must be obeyed, absolutely not broken. If you lose a wallet or a phone, you can be sure that if anyone finds it, they’ll take it to the nearest police box (or Lost & Found office) and you’ll get it back. Clean streets, safety, life according to the ethos “Do not do to others what you would not have them do to you” — she says and assures us that it’s the most convenient city in the world. After over two years as an expat, Stasia has no plans of coming back. — Japan still occupies a high position on the list of the best countries to live in and I can confirm it. And because living here is a dream that came true, I won’t give it up so quick. However, I can’t tell for sure there will be no changes some day– she says. She admits that what she misses the most from Poland is food: soups, bread, ham. This year her cravings were fulfilled at the annual Polish Festival in Roppongi, where she could buy things like Polish apple pie, sour rye soup and fruit beer — not that common in Japan. Japanese attendees could learn some more about Polish culture and customs. – I am observing more and more events connected to Poland, like the aforementioned event in Roppongi or a Polish Movie Festival that took place in Shibuya last year. In the biggest DVD rental store chain you can find more and more Polish movies, which naturally, makes me very happy– she says. How does she remember our city? I attended high school in Tarnow, so my memories are also typically ‘high school’. Taking a stroll in the park after classes, rock concerts, coffee in my favourite cafe, delicious waffles with whipped cream… I’ll be sure to visit all those places again, if I only get a chance to be in Tarnow again. 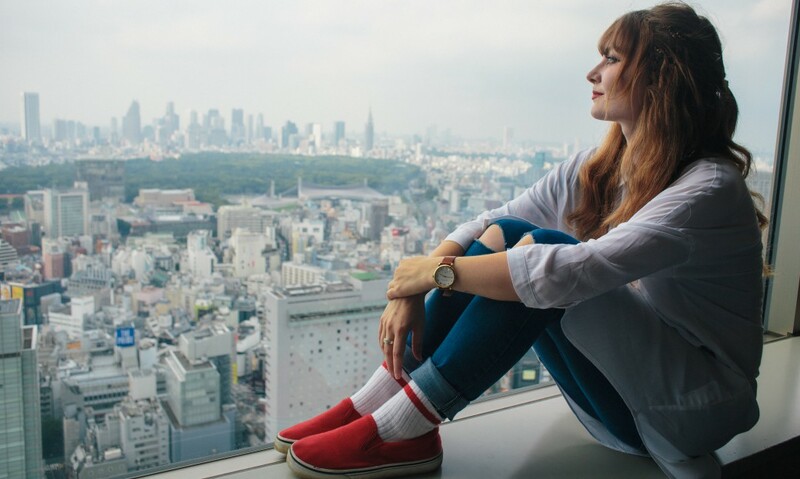 I’m a 23 year old Polish girl living her Tokyo dream since the 12th of July, 2012. My first memories? The city lights, the sweet smell of a humid summer, the singing cicadas, the stray cats in Nippori, geeky Akihabara, the colourful people of Harajuku, fashionable Omotesando and the cozy cafes of Koenji. I love exploring Tokyo, traveling in Japan, finding new places. This is the place that makes me truly happy. Madosh Cafe, Omotesando. Delicious avocado dishes and a lovely pug keeping the guests company (also little dwarf figurines flipping fingers…hmm). American burger place in Kita-Senju. I found it by a total coincidence and fell in love with its vintage interior and photos of Elvis, Marylin and the Beatles all over the place. Church themed restaurant in Shinjuku. They have real soutanes and altars. If that doesn’t convince you to go, then I don’t know what would. Tattoo studio La Ruche, Shinjuku 5-Chome. I got my old tattoos fixed and new tattoos done there – I trust them entirely. Jiyugaoka, O’Carolans Pub. It doesn’t feel like Japan at all, and sometimes that’s exactly what expats need. Pint of Guiness for 900 yen though. The coziest place in Shibuya, a lovely cafe full of candles and flowers. Veranda swings and sakura latte, two good enough reasons to go. Just a hobby I enjoy on the days when I don’t need to put a suit on. I have always thought that tatooed bodies are beautiful. And yeah, all these babies are mine and there are still many more to come. I started volunteering at an orphanage (it’s a bit different in Japan though, I might explain some other time) in July 2013. I don’t have much free time, but I always keep in mind that just a couple of hours for me means the world to them. Before I moved to Japan, I have travelled to quite a few places. I have been to Slovakia, Hungary, Italy, France (Paris, Eze, Nice), Monaco, Holland, Ireland, Croatia. I have studied and lived in the UK for a year. I don’t know where I’ll be in a couple of years. For now…I guess I’ll just stay here for a while and see where my life takes me.